From the Italian word for "strings"; these round thin strands are our most beloved pasta shape. 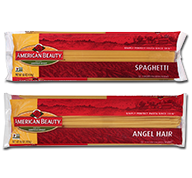 A versatile pasta shape, spaghetti can be used in entrées, side dishes, cold salads, or broken and used in soups. Toss spaghetti with almost any pasta sauce of varying thickness. Tomato or cream sauces, broth-based sauces, olive oil tosses and meat sauces all work well with spaghetti. Available in 16, 24, 32 and 48 oz.